We are exploring many different layers of Cinema, this month we are presenting Earth Poetry. Half the price of a commercial complex, double the fun and culture! 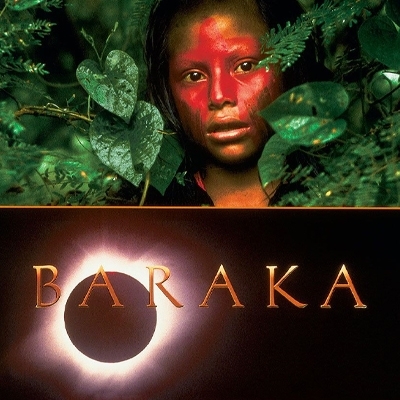 Baraka is a documentary film with no narrative or voice-over. It explores themes via a compilation of natural events, life, human activities and technological phenomena shot in 24 countries on six continents over a 14-month period. The film is Ron Fricke’s follow-up to Godfrey Reggio’s similar non-verbal documentary film Koyaanisqatsi. Fricke was cinematographer and collaborator on Reggio’s film, and for Baraka he struck out on his own to polish and expand the photographic techniques used on Koyaanisqatsi. Shot in 70mm, it includes a mixture of photographic styles including slow motion and time-lapse. To execute the film’s time-lapse sequences, Fricke had a special camera built that combined time-lapse photography with perfectly controlled movements. Locations featured include the Church of the Holy Sepulchre in Jerusalem, the Ryoan temple in Kyoto, Lake Natron in Tanzania, burning oil fields in Kuwait, the smouldering precipice of an active volcano, a busy subwayterminal, tribal celebrations of the Maasai in Kenya, and chanting monks in the Dip Tse Chok Ling monastery. The film features a number of long tracking shots through various settings, including Auschwitz and Tuol Sleng, over photos of the people involved, past skulls stacked in a room, to a spread of bones. It suggests a universal cultural perspective: a shot of an elaborate tattoo on a bathing Japanese yakuza precedes a view of tribal paint.